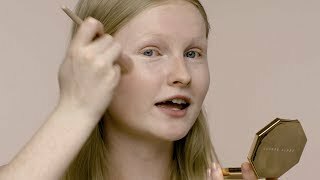 A longwear, transfer-resistant bronzing powder in 8 groundbreaking shades, each carefully curated to bring all skin tones to life with an instant sun-soaked glow. Bask in that post-vacay bronze year-round with Sun Stalk’r Instant Warmth Bronzer. 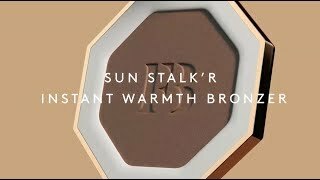 Rihanna dreamt of an easy-to-use powder bronzer that truly works for everyone, so she created Sun Stalk’r in 8 versatile shades that bring out the warmth in all skin tones, from the fairest to the deepest! SHADY BIZ: SYNTHETIC FLUORPHLOGOPITE, TALC, MAGNESIUM MYRISTATE, HDI/TRIMETHYLOL HEXYLLACTONE CROSSPOLYMER, MICA, POLYMETHYL METHACRYLATE, DIMETHICONE, ISODECYL NEOPENTANOATE, SILICA, TRIMETHYLSILOXYSILICATE, TRIETHOXYCAPRYLYLSILANE, POLYPROPYLSILSESQUIOXANE, DIISOSTEARYL MALATE, CAPRYLYL GLYCOL, DIMETHICONOL, PHENOXYETHANOL, OCTYLDODECYL STEAROYL STEARATE, HEXYLENE GLYCOL, LAUROYL LYSINE, TOCOPHERYL ACETATE, TOCOPHEROL, AQUA/WATER/EAU, MALTODEXTRIN, CARICA PAPAYA (PAPAYA) FRUIT EXTRACT, MANGIFERA INDICA (MANGO) FRUIT EXTRACT, CALCIUM SODIUM BOROSILICATE, CALCIUM ALUMINUM BOROSILICATE, XANTHAN GUM, ETHYLHEXYLGLYCERIN, SORBIC ACID, TIN OXIDE, IRON OXIDES (CI 77491, CI 77492, CI 77499), MANGANESE VIOLET (CI 77742), TITANIUM DIOXIDE (CI 77891). PRIVATE ISLAND: SYNTHETIC FLUORPHLOGOPITE, TALC, MAGNESIUM MYRISTATE, HDI/TRIMETHYLOL HEXYLLACTONE CROSSPOLYMER, MICA, POLYMETHYL METHACRYLATE, DIMETHICONE, ISODECYL NEOPENTANOATE, SILICA, TRIMETHYLSILOXYSILICATE, TRIETHOXYCAPRYLYLSILANE, POLYPROPYLSILSESQUIOXANE, DIISOSTEARYL MALATE, CAPRYLYL GLYCOL, DIMETHICONOL, PHENOXYETHANOL, OCTYLDODECYL STEAROYL STEARATE, HEXYLENE GLYCOL, LAUROYL LYSINE, TOCOPHERYL ACETATE, TOCOPHEROL, AQUA/WATER/EAU, MALTODEXTRIN, CARICA PAPAYA (PAPAYA) FRUIT EXTRACT, MANGIFERA INDICA (MANGO) FRUIT EXTRACT, CALCIUM SODIUM BOROSILICATE, CALCIUM ALUMINUM BOROSILICATE, XANTHAN GUM, ETHYLHEXYLGLYCERIN, SORBIC ACID, TIN OXIDE, IRON OXIDES (CI 77491, CI 77492, CI 77499), TITANIUM DIOXIDE (CI 77891), MANGANESE VIOLET (CI 77742). I$LAND TING: SYNTHETIC FLUORPHLOGOPITE, TALC, MAGNESIUM MYRISTATE, HDI/TRIMETHYLOL HEXYLLACTONE CROSSPOLYMER, POLYMETHYL METHACRYLATE, MICA, DIMETHICONE, ISODECYL NEOPENTANOATE, TRIMETHYLSILOXYSILICATE, TRIETHOXYCAPRYLYLSILANE, POLYPROPYLSILSESQUIOXANE, SILICA, DIISOSTEARYL MALATE, CAPRYLYL GLYCOL, DIMETHICONOL, PHENOXYETHANOL, OCTYLDODECYL STEAROYL STEARATE, HEXYLENE GLYCOL, TOCOPHEROL, TOCOPHERYL ACETATE, LAUROYL LYSINE, AQUA/WATER/EAU, MALTODEXTRIN, CARICA PAPAYA (PAPAYA) FRUIT EXTRACT, MANGIFERA INDICA (MANGO) FRUIT EXTRACT, CALCIUM SODIUM BOROSILICATE, CALCIUM ALUMINUM BOROSILICATE, XANTHAN GUM, ETHYLHEXYLGLYCERIN, SORBIC ACID, TIN OXIDE, TITANIUM DIOXIDE (CI 77891), MANGANESE VIOLET (CI 77742), IRON OXIDES (CI 77491, CI 77499, CI 77492). BAJAN GYAL: SYNTHETIC FLUORPHLOGOPITE, TALC, MAGNESIUM MYRISTATE, HDI/TRIMETHYLOL HEXYLLACTONE CROSSPOLYMER, MICA, POLYMETHYL METHACRYLATE, DIMETHICONE, ISODECYL NEOPENTANOATE, SILICA, TRIMETHYLSILOXYSILICATE, TRIETHOXYCAPRYLYLSILANE, POLYPROPYLSILSESQUIOXANE, DIISOSTEARYL MALATE, CAPRYLYL GLYCOL, DIMETHICONOL, PHENOXYETHANOL, OCTYLDODECYL STEAROYL STEARATE, HEXYLENE GLYCOL, LAUROYL LYSINE, TOCOPHERYL ACETATE, TOCOPHEROL, AQUA/WATER/EAU, MALTODEXTRIN, CARICA PAPAYA (PAPAYA) FRUIT EXTRACT, MANGIFERA INDICA (MANGO) FRUIT EXTRACT, CALCIUM SODIUM BOROSILICATE, CALCIUM ALUMINUM BOROSILICATE, XANTHAN GUM, ETHYLHEXYLGLYCERIN, SORBIC ACID, TIN OXIDE, CHROMIUM OXIDE GREENS (CI 77288), IRON OXIDES (CI 77491, CI 77499, CI 77492), MANGANESE VIOLET (CI 77742), TITANIUM DIOXIDE (CI 77891). CARAMEL CUTIE: SYNTHETIC FLUORPHLOGOPITE, MAGNESIUM MYRISTATE, TALC, HDI/TRIMETHYLOL HEXYLLACTONE CROSSPOLYMER, POLYMETHYL METHACRYLATE, DIMETHICONE, MICA, ISODECYL NEOPENTANOATE, SILICA, TRIMETHYLSILOXYSILICATE, TRIETHOXYCAPRYLYLSILANE, POLYPROPYLSILSESQUIOXANE, DIISOSTEARYL MALATE, CAPRYLYL GLYCOL, DIMETHICONOL, PHENOXYETHANOL, OCTYLDODECYL STEAROYL STEARATE, HEXYLENE GLYCOL, TOCOPHERYL ACETATE, TOCOPHEROL, AQUA/WATER/EAU, MALTODEXTRIN, CARICA PAPAYA (PAPAYA) FRUIT EXTRACT, MANGIFERA INDICA (MANGO) FRUIT EXTRACT, LAUROYL LYSINE, CALCIUM SODIUM BOROSILICATE, CALCIUM ALUMINUM BOROSILICATE, XANTHAN GUM, ETHYLHEXYLGLYCERIN, SORBIC ACID, TIN OXIDE, TITANIUM DIOXIDE (CI 77891), CHROMIUM OXIDE GREENS (CI 77288), IRON OXIDES (CI 77492, CI 77491, CI 77499). COCO NAUGHTY: SYNTHETIC FLUORPHLOGOPITE, MAGNESIUM MYRISTATE, TALC, HDI/TRIMETHYLOL HEXYLLACTONE CROSSPOLYMER, POLYMETHYL METHACRYLATE, DIMETHICONE, MICA, ISODECYL NEOPENTANOATE, SILICA, TRIMETHYLSILOXYSILICATE, TRIETHOXYCAPRYLYLSILANE, POLYPROPYLSILSESQUIOXANE, DIISOSTEARYL MALATE, CAPRYLYL GLYCOL, DIMETHICONOL, PHENOXYETHANOL, HEXYLENE GLYCOL, OCTYLDODECYL STEAROYL STEARATE, TOCOPHERYL ACETATE, TOCOPHEROL, AQUA/WATER/EAU, MALTODEXTRIN, CARICA PAPAYA (PAPAYA) FRUIT EXTRACT, MANGIFERA INDICA (MANGO) FRUIT EXTRACT, LAUROYL LYSINE, CALCIUM SODIUM BOROSILICATE, CALCIUM ALUMINUM BOROSILICATE, XANTHAN GUM, ETHYLHEXYLGLYCERIN, SORBIC ACID, TIN OXIDE, TITANIUM DIOXIDE (CI 77891), IRON OXIDES (CI 77491, CI 77492, CI 77499), MANGANESE VIOLET (CI 77742). MOCHA MAMI: SYNTHETIC FLUORPHLOGOPITE, MAGNESIUM MYRISTATE, TALC, HDI/TRIMETHYLOL HEXYLLACTONE CROSSPOLYMER, POLYMETHYL METHACRYLATE, DIMETHICONE, MICA, ISODECYL NEOPENTANOATE, SILICA, TRIMETHYLSILOXYSILICATE, TRIETHOXYCAPRYLYLSILANE, POLYPROPYLSILSESQUIOXANE, DIISOSTEARYL MALATE, CAPRYLYL GLYCOL, DIMETHICONOL, PHENOXYETHANOL, OCTYLDODECYL STEAROYL STEARATE, HEXYLENE GLYCOL, TOCOPHERYL ACETATE, TOCOPHEROL, LAUROYL LYSINE, AQUA/WATER/EAU, MALTODEXTRIN, CARICA PAPAYA (PAPAYA) FRUIT EXTRACT, MANGIFERA INDICA (MANGO) FRUIT EXTRACT, CALCIUM SODIUM BOROSILICATE, CALCIUM ALUMINUM BOROSILICATE, XANTHAN GUM, ETHYLHEXYLGLYCERIN, SORBIC ACID, TIN OXIDE, TITANIUM DIOXIDE (CI 77891), IRON OXIDES (CI 77499, CI 77491, CI 77492), MANGANESE VIOLET (CI 77742). Over two years in the making, each shade of Sun Stalk’r was meticulously calibrated to serve a diverse range of skin tones. Rihanna made sure to create shades that bring out the warmth in all skin tones, from the fairest to the deepest! For an instant all-over bronzed glow, apply with the Cheek-Hugging Bronzer Brush 190. For a more targeted application, contour with the Sculpting Bronzer Brush 195. Sun Stalk’r is great for warming up—not necessarily deepening—your skin tone, giving it life! It has the right pigments to bring out the warmth in even the deepest skin tones. Layer two shades for extra bronzed-out dimension. Try a lighter bronzer shade for all-over glow, then add a deeper shade to sculpt cheekbones, jawline, temples, and the sides of your nose.